In Thursday’s press conference, John Hackworth said that while the team showed improvement in the games against New York and Orlando, it was concerning that the team had allowed counterattacking goals. I would say our ball movement and ball circulation has been much better both against Red Bull and Orlando. We were pressing those two teams pretty high up the field and that, for the most part, was pretty good. In both of those games, we were successful in locking those teams in their own half for a while and sustaining that. At the same time, our concerns are that we have given up two goals that were counter-attack goals that were, in our opinion, goals that we should have been able to cut out before they got to a dangerous point. So we clearly still have some work to do in that area. And there are a lot of other pieces that we need to add in the next two weeks to truly be ready for our season opener against Portland. That is what our focus is right now. With a starting defense in a Saturday’s rain-delayed match against Columbus that featured Fabinho on the left, Sheanon Williams on the right, and a centerback pairing of Amobi Okugo and Aaron Wheeler, the Union prevented any open play goals but lost 1-0 thanks to an 87th minute penalty kick after Amobi Okugo was called for fouling Ryan Finley in the box. Every game we are gradually getting better in terms of our movements both on and off the ball. Our interchangeability is good and you can see that we create chances as well. But this is what preseason is for, it’s not about results but about getting on the right page and getting our fitness up because it’s not about now, but about being mentally and physically prepared for that first game of the season. Match recaps from PhiladelphiaUnion.com, TheCrew.com, Columbus Dispatch, Philly Soccer News and Independence Sports Magazine. Checkout this video recap from the game on the Union website that includes good comments from John Hackworth, Maurice Edu, and Brian Carroll, as well as some footage from the game. The Union next face Toronto in the final group game of the Disney tournament on Wednesday at 1 pm. The game will be live streamed on the Union website. 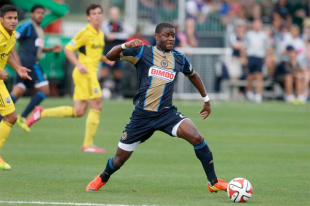 At the Union website, Kevin Kinkead looks at the team’s shift toward playing a 4-3-3. As is often the case when discussing formations in so fluid a game as soccer, it helps to have a less than rigid understanding of what “playing a 4-3-3” might mean for the Union. Hackworth says in the article, “I think the reason I like to coach from the 4-3-3 is that you get a lot of potential (situations) that are the foundation of your system, regardless of the formation. I think you are going to see us playing with two midfielders one game, and we’re playing with two forwards the next. We are going to tweak that and find what we feel is best for our players and certainly what is best when we are playing opponents.” In other words, the way the Union lineup on paper for a given game, let alone how they actually play in that game, will be reflective of the particular qualities and strengths of the starting players, which itself will be influenced by the tactical strengths and weaknesses of a given opponent (not to mention whether a game is taking place at home or away). Edu is a guest on the latest ExtraTime Radio podcast. Edu, Jack McInerney, Danny Cruz, Amobi Okugo, Sheanon Williams, Ray Gaddis, Ethan White, and Aaron Wheeler used their day off on Sunday to go to the Daytona 500. Cruz, Edu, and Okugo each posted photos from the vent. At MLSsoccer.com, Dave Zeitlin has an article on “one of the biggest surprises in camp,” Richie Marquez. At the Union website, Andy Jasner has an article with John Hackworth’s comments from Thursday’s press conference on the Union’s progress in the preseason. Brotherly Game’s series on positional depth continues with a look at wingers. Fansided has an “article” on Richie Marquez, the contents of which consist entirely of quotes lifted from Dave Zeitlin’s article on Marquez and Andy Jasner’s article on Thursday’s press conference. In other Disney Pro Classic results, Sporting Kansas City remains undefeated after topping the Fluminese U-23 team 3-0. The New York Red Bulls defeated Montreal, 3-0. Orlando City scored an 87th minute equalizer to draw 1-1 with Toronto. In the Carolina Challenge Cup, DC United defeated Houston, 2-0. Seattle defeated USL PRO side Charleston Battery, 2-1, thanks to an 89th minute penalty kick. In the Desert Diamond Cup, Chicago defeated PDL side FC Tucson, 2-0. Bakary Soumare scored the second goal for Chicago, who are undefeated in six preseason matches. Former Reading United man Deshorn Brown scored the lone goal in Colorado’s 1-0 win over Real Salt Lake. New England was up 2-0 before falling 3-2 to Chivas USA. Robbie Keane scored two goals and an assist in LA Galaxy’s 3-0 win over new USL PRO side LA Galaxy II. At the IMG Academy Stadium in Bradenton, Fla., FC Dallas demolished NASL side Fort Lauderdale Strikers, 6-1. In the opening of the Rose City Invitational Tournament, San Jose defeated tournament organizers Portland, 1-0. Vancouver gave Jamaican National Premier League side Portmore United a 5-1 drubbing, a scoreline that included a second half brace from former Union man Jordan Harvey. Portmore’s goalkeeper was given a red card 15 minutes into the game for handling the ball outside of the box. Columbus have signed Costa Rican defender Giancarlo Gonzalez. Dallas have acquired Uruguayan forward David Texeira from FC Groningen as a young designated player. The Professional Soccer Referees Association, the union that represents MLS referees, voted 64-1 to authorize its executive board to call a strike at any time over unfair labor practices from the Professional Referees Organization. Jeff Carlisle writes at ESPN, “Calling a strike due to unfair labor practices, as opposed to economic reasons, is significant, in that it would make it illegal for PRO to hire permanent replacements. If the PSRA members decided to end the strike, PRO would be obligated to hire the referees back immediately. If PRO failed to do so, it would be liable for back pay and benefits.” The two sides are currently negotiating a collective bargaining agreement. At SB Nation, Jeremiah Oshan looks some of the issues that will be in play when MLS and the Players Union negotiate their new CBA. The current agreement expires this year. The Orlando Sentinel reports, “A fight over public soccer fields between Orange County and the Orlando City Soccer Club has escalated and threatens to hold up taxpayer subsidies that the new pro team needs to build an $84 million downtown stadium.” At issue is Orlando SC’s desire to get preferential time slots on the public fields for its outreach programs in return for the $3 million it has pledged to pay over 15 years to run the fields. ProSoccerTalk ranks the prospects of the six leading contenders for the final two MLS franchises. At the Voice of San Diego, Beau Lynott considers how the Chivas USA news might be an opportunity for San Diego to become the home of an MLS franchise. Efforts in St. Louis to land a MLS franchise are beginning with interest in bringing in a USL PRO franchise. At Philly Soccer News, Charles Cuttone talks to USL PRO president Tim Holt about the ongoing success of the MLS-USL PRO partnership. According to FIFA, the US leads non-Brazilian fans in ticket purchases for the World Cup, with some 125,465 tickets distributed to the US so far. That figure is more than double the numbers for Colombia, the next country on the list, whose total currently stands at 60,231. In all, some 2.3 million World Cup tickets have been allocated so far, with 906,433 going to Brazil. More on the news from US Soccer and The New York Times. The US U-23 WNT team will be competing in the Six-Nations Tournament in La Manga, Spain, which takes place Feb. 24-March 6. With the team is Sellersville’s Jennifer Hoy, who plays for the Chicago Red Stars. The US U-18 WNT will also be in La Manga for the Ten Nations Tournament, which takes place from March 3-13. Michel Platini calls the “triple punishment” of a red card, a penalty kick, and a suspension for a foul in the box “this stupid rule.” What do you know, Platini and I agree on something. The Kinkead article is notable because I think it’s the first time the Union messaging has included the term ‘total football’ — basically 10 interchangeable guys on the field at all times. If that’s the Union’s plan, it explains the lack of interest in keeping a prototypical CB on the roster. It also will make for a winning strategy in MLS only if a) the Academy produces the best talent in the world, like Barcelona, or b) the team promises to never, ever concede a corner kick. I’m still optimistic about the season, but the fact that the first team hasn’t scored a goal from the run of play all preseason has me a little worried, I must admit. Based on all articles and first hand accounts, we’ve looked very good in the build up and have created plenty of chances. So based on that I am less worried. I would be more worried if our newly revamped midfield looked incapable of playing together. But based on reports, it is totally the opposite. Maybe I missed it, but have we heard yet why Connor Casey hasn’t featured in the preseason at all? Injury? I assume it must be, but I don’t think it has actually been mentioned in any news. Also, are we reading anything into the fact that Zac didn’t play in the Columbus game? Funny about Bleacher Report. I also hate how their slideshows always end on “9 of 10” to get you to click “Next” to land on a completely different article. Shameless. Just one more thing. That MLS article about Marquez sound suspiciously like fodder for contract negotiations with a CB. “No, we’re fine, we don’t really need a CB.” I hope that’s not the case, but I wouldn’t be surprised. haha.. looks like I was right! And yes, I am OK with that pickup! Thanks Mike McGee. SOUNDS good. What kind of player is Berry? I seem to remember thinking of him as a more technical defender like Okugo. Am I wrong there? He’s a talented centerback with a bigger body. Very, very strong in the air. Great signing. Need = addressed. Union have run into some tough weather for preseason training down here- not usually this wet this time of year. NYRB game played in rain, Columbus game delayed by rain, and Wednesday forecast is for straight rain. Would like to see these guys get a chance to play together on a dry field. On the plus side, I guess it will prepare them to open in Portland.